I love attending conferences. It combines two of my favorite things: learning and meeting new people. I always feel I get a good return on my investment of time. You should be able to stay in touch with your office on wifi. This can be done from anywhere at the conference. Don’t get stuck in your hotel room in the morning. If you are traveling a long distance, it helps you hit the ground running on the first day. There is usually a welcome reception or a party hosted by a conference sponsor. If you are a speaker, there is often a special party for speakers. This is a nice opportunity to talk at leisure with fellow speakers. Always get on the hashtag for the conference early. In the case of the upcoming New Media Expo and BusinessNext Social, it is #NMX #BizNext. (A full access pass to NMX gets you into both conferences.) Check for a conference Facebook Page or Group and join it. There may also be a GooglePlus Brand Page and Community. If you are lucky someone has created a Twitter list. 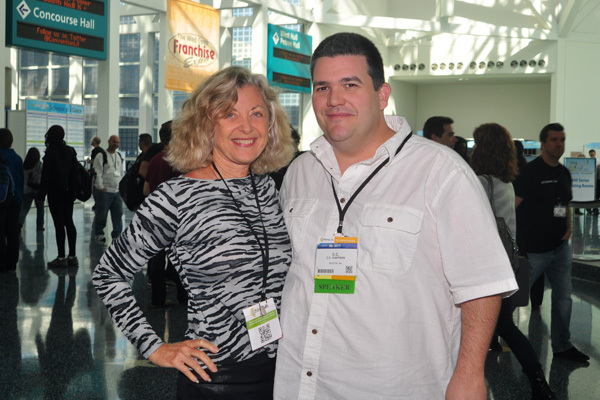 (Here are the Twitter lists for the speakers at NMX and BusinessNext Social.) Use the hash tags when you post conference photos on Instagram. Be sure to check-in on FourSquare while you are at the conference. NMX is using Presdo Match for a “speed dating” 75 minute event on the first day of NMX, where businesses and brands can meet with content creators. If you don’t care about “speed dating,” (though you should consider these benefits) don’t let that deter you from checking your profile and “liking” attendees of interest. You can use Presdo Match to support your networking efforts before, during and after an event to connect with attendees, exhibitors and sponsors. Though Presdo Match contacting is only set up for speed dating this time, you can click “like” on fellow attendee profiles and use traditional connections through the social platforms provided in each profile, as well as the contact me interface every blogger includes with their blog. This is my Presdo Match profile and tips on how to use Presdo from the software creator. There is not currently a native iPhone or Android application in development, but they do offer a mobile-optimized web application. If you click a Presdo Match link or sign in directly from a web browser (e.g. Safari or Chrome) on your a mobile device, you will see a version tailored for your smaller screen. Presdo Match is a networking technology launched in 2010 for the trade show and conference industry. Eric Ly, co-founder of LinkedIn, is the founder of Presdo. It can be seen as a “mini LinkedIn” that surrounds an event, where people can explore rich profiles of everybody else that is participating. NMX is using another conference networking application called Sched for the conference schedule. Sched gives you another avenue to connect with speakers. Find a speaker you know by name on the schedule, click through to their session and click interested or just put it on your schedule so you don’t forget to attend. You can search sessions by category as well there. You can click through to speaker profiles. Mine is here mine. Note there are separate speaker profiles for Sched and Presdo Match. Many people will find this difficult to avoid. The first night is always the most exciting. You are seeing people you haven’t seen in a while, and everyone is very happy. But keep in mind you have days to go – try to pace yourself. The way conferences are set up, it is often impossible to attend all the sessions. Some conferences include archives in their set price, while others such as NMX offer less expensive tickets with archives that are priced separately. Knowing you have the archives allows you to linger in the hallway if an opportune chat with someone presents itself. I have captured some of the great people I have met in photos and in videos. Here is my roundup from BlogWorld 2011. My historical Flickr “collection” consists of nine albums of photos I have taken at the five NMX’s (formerly BlogWorld) that I have attended. Allison Boyer summed up NMX well in photos.